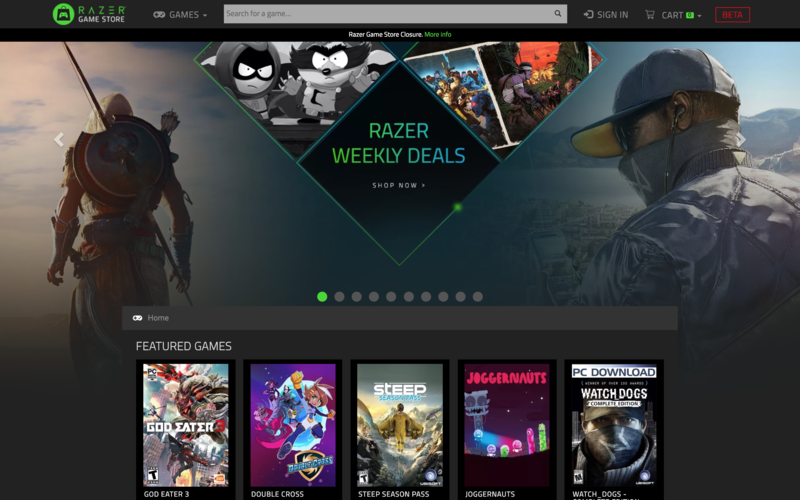 The Razer Game Store launched worldwide in April 2018 with the aim of taking a slice of a game sales business that is dominated by Steam. Razer’s offering tied into its gamer credit (virtual currency) strategy to incentivize its customers to buy hardware and digital content with the promise of discounts. The company didn’t comment on why the store is closing, but you’d imagine that it didn’t go as well as Razer had hoped. It sure takes a lot to bite into digital game sales, but the rewards are potentially lucrative. Steam made $4.7 billion in 2017 (we don’t yet know its total for 2018) and Epic Games, buoyed by the runaway success of Fortnite, banked a $3 billion profit last year across its entire business, sources previously told TechCrunch. Amazon-owned Twitch — which dominates the live-streaming space — had its own store before it closed, while Epic launched a very competitive offering at the end of 2018. The Epic Games Store, though, is fairly sparsely populated at this point. It is a long-term project, but the fact that even a company of the size and influence of Epic needs time goes to show the struggle that any new entrant will face. The Razer Game Store will close its doors at 1am PST February 28. All purchased games will continue to work and pre-ordered titles will ship as planned, according to Razer. Discount vouchers must be used before that date, however. “We will be investing in other ways to deliver great content and introduce game promotions through Razer Gold, our virtual credits system,” the company said, perhaps hinting at tie-ins with other game stores in the future. Razer went public with an IPO in Hong Kong in 2017. Note: The original version of this post has been updated to correct that Twitch’s store has in fact already closed, such is the challenge of rivaling Steam. Thank you to reader James Binns for spotting the error and writing in.